(Optional) - A moulded concrete tile which is mechanically fastened to the eaves of the roof. 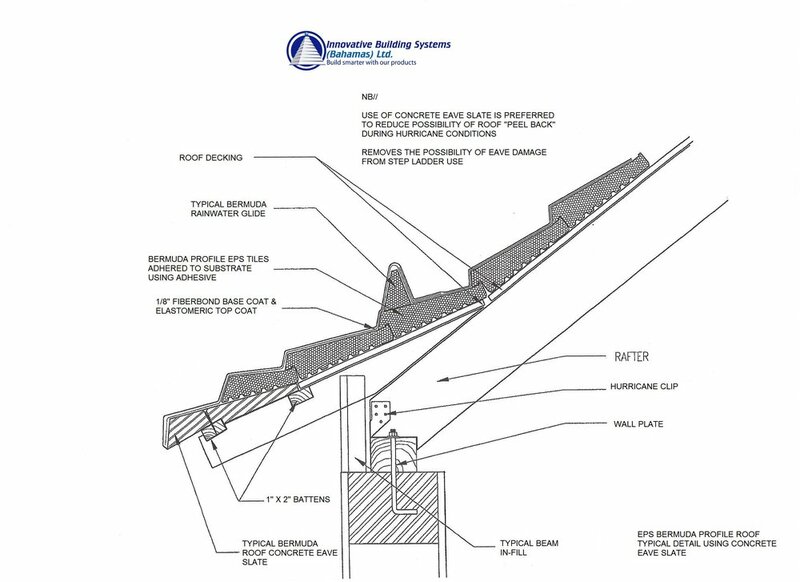 Eave slate serve two purposes (1) they prevent eave damage when leaning a ladder on the eave to access the roof (2) they are the first line of defense in reducing the occurrence of up-lift in high wind conditions, as uplift tends to start at the eaves. Contrary to what our competitors use, our EPS tiles are NOT 4’x8’x4” because it has been proven time and time again that large tiles result in cracking in the roof. This cracking is as a result of the Co-efficient of Linear Expansion (CLE), our tile are small enough to ensure that the amount of joints are sufficient to take up the CLE resulting in very few, if any, instances of cracking. We pride ourselves on long-term performance. From an aesthetic perspective, the profile of our EPS tiles is traditional Bermuda, so that to the untrained eye there is no difference between our EPS roof and our Traditional Bermuda Roof. Plywood has traditionally been used as a roof substrate in the Bahamas and Caribbean and most would be aware that after time plywood begins to delaminate, shortening the life of the roof. To avoid this problem, we recommend the use of a cement board as an alternative substrate. While the use of cement board may increase upfront costs, it will pay for itself in the long-term because it will not delaminate and it is fire and insect resistant. 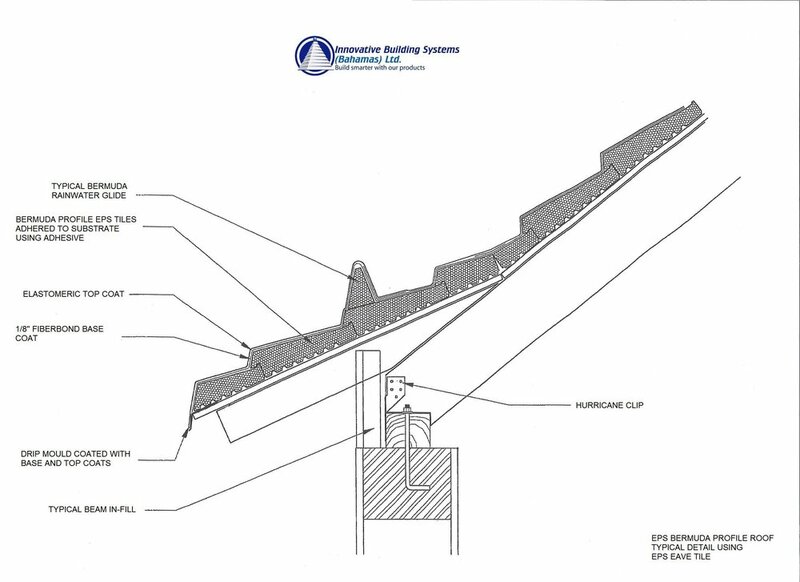 Our roofs are typically installed in Hurricane regions, therefore, we offer the highest possible Hurricane resistant roof, a roof that has been tried, tested and proven in Bermuda for over 50 years and has passed the most important test of all…….Field Tests. The key reason our roof is able tohold up extremely well in Hurricane conditions is because of the wind rating of the Cement Board, see Wind Load Chart attached. 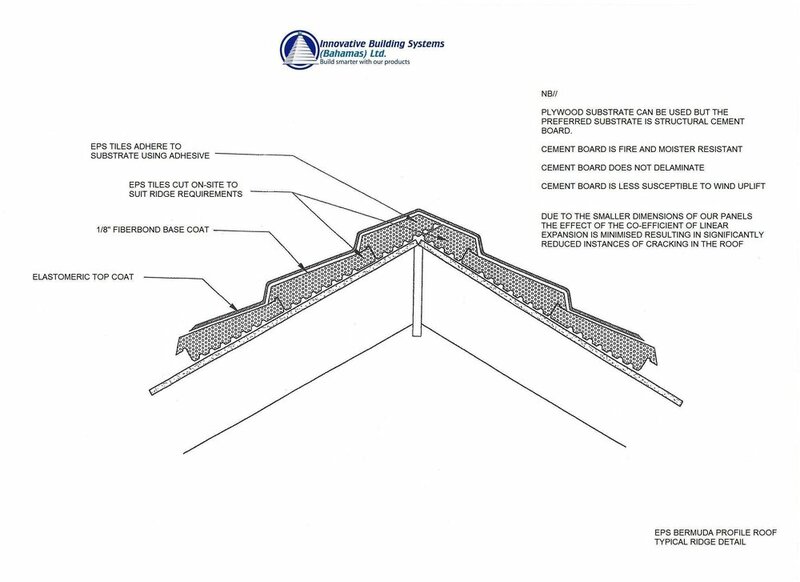 Most roof structures in the region use 24”o.c. truss spacing so we typically use 20mm or ¾” Cement Board with H-Clips to minimize deflection. Our EPS roof has its “roots” in Bermuda as a similar system was first created in Bermuda in 1968. Adhering the tiles directly to the substrate provides a superior uplift threshold. Additionally, this method allows the EPS tiles to move with, not against, the flexing of the roof and creates a monolithic structure. 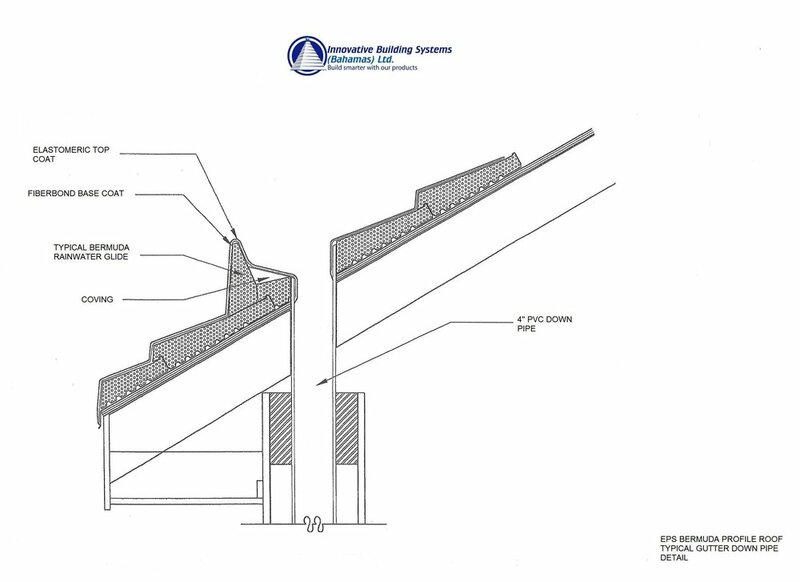 For improved uplift performance and to create a monolith roof structure we do not mechanically fasten the EPS tiles to roof, we adhere the EPS tiles to the Cement Board. In Cases where the client or contractor has already applied Plywood and a waterproof member we can use EFIS Screws to fasten EPS Tile. This is a proprietary cementious product that creates a hard shell over the EPS tiles yet it is pliable enough to absorb the expansion and contraction of the EPS tiles to help to reduce/eliminate cracks in the roof. On many occasions we use Fiberbond to coat ridges, valleys and hips of our Traditional Bermuda Roofs to prevent cracking at these locations. We offer two high quality Elastomeric paint options (1) for use in non-potable water applications, this option stays bright white for a very long period of time as it does not harbour mold and mildew and (2) an NSF potable water approved Elastomeric paint used where the EPS Bermuda Profile Roof is to be used in its traditional purpose, that is for the catchment of rain water for domestic use.